The flag of Uruguay consists of nine alternating stripes of equal width. There are five white stripes and four blue ones. The top and bottom stripes are white. In the top left corner of the flag there is a white square with a yellow/gold sun in its center that has 16 alternating straight and curvy waves. Meaning: The sun emblem is the 'Sun of May'; it is a symbol of freedom and independence. 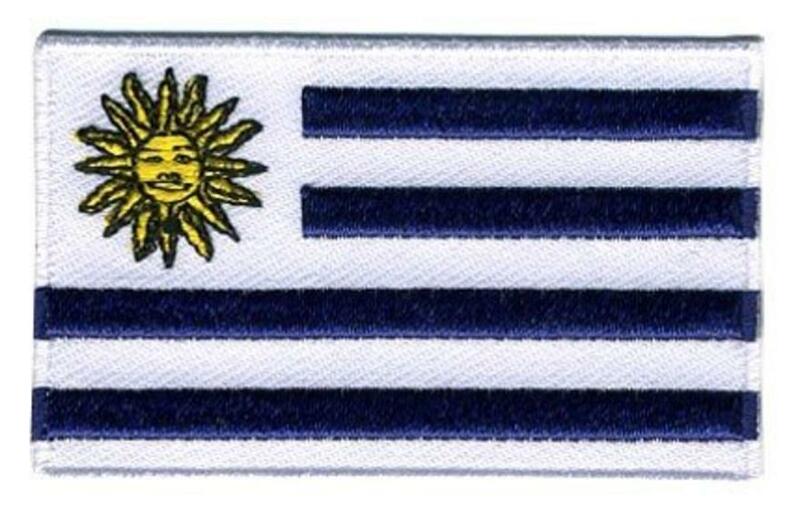 The nine stripes represent the nine provinces of Uruguay, which existed at the time of the flags creation. History: The Uruguay flag was adopted on July 11, 1830, making it one of the world's oldest flags. When it was first adopted in 1828 it had 17 stripes but it was reduced to nine in 1830. Uruguay declared independence from Brazil on August 25, 1825. Interesting facts: The colors of the Uruguay flag were inspired by the flag of Argentina; while the United States national flag influenced the design (source: worldflags101).